UPDATE: thanks to all your support, I finished my crowdfunding campaign with $12,979.00 in preorders. The last few days saw the crowdfunding campaign skyrocket – something I did not predict happening at all. This has been a whirlwind ride and I’m so grateful – so thank you! If you’re interested in being notified about the book when it releases, to hear about its progress, or be the first in line to order the book when it’s in all major online bookstores, sign up here. 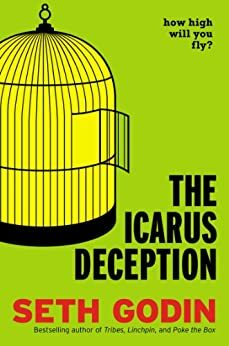 In July 2012, Seth Godin started a campaign to fund the production of his latest book: The Icarus Deception. Godin did this through a platform called Kickstarter.com, which allowed his loyal fanbase to pledge funds to the book before it was finished and ready for distribution. Godin set a minimum funding goal of $40,000 (enough presales for a traditional publisher to take notice and sign the book for distribution). By the end of his 30 day campaign Godin generated $287,342 in presales of his yet to be finished and published book. But only if you can effectively market and promote your crowdfunding campaign. In today’s blog post, I’m going to show you how. Crowdfunding allows any creator the ability to pre-sell a product in order to raise the funds necessary to build and ship it. The creator (aka crowdfunder). This is the author, artist, or entrepreneur who is attempting to fund the production of his new thing (novel, artbook, kitten mittens, whatever). The financial backer / supporter / pre-orderer (aka crowdfundee…I may have made this term up). This is the person who commits funds to the production of whatever the creator is attempting to fund. This person does not get an equity stake in the project (not in the context we’re talking about, although platforms like this are starting to appear), but generally receives some great rewards and discounts for being an early supporter. The platform. This is the place where the exchange takes place (more on this below). In exchange for the support of early adopters, crowdfunding artists, writers, and creators have the opportunity to offer some pretty awesome rewards and discounts, exclusive for the length of the campaign (or until they’re sold out). By crowdfunding, Seth raised $287,342 in just 30 days – before he had to print a single book. This was more than 7 times the minimum threshold required to fund his book production. Ever since watching this success story in action (and many more just liked it), I’ve wanted to crowdfund a book. Two weeks ago, I finally pulled the trigger. 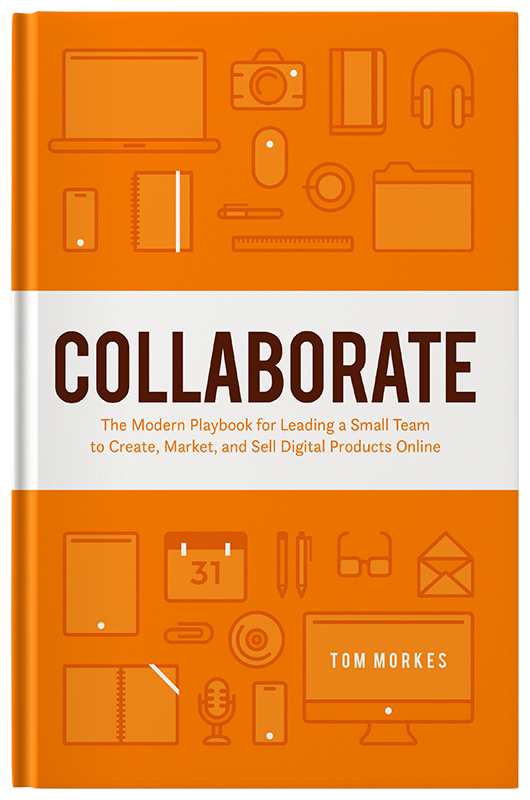 Collaborate: The Modern Playbook for Leading a Small Team to Create, Market, and Sell Digital Products Online is now available for pre-order. In less than 2 weeks, I’ve been fortunate enough to fully fund the project. Click here to support Collaborate. All great leaders and organizations – the ones people embrace and follow – have a compelling “why” or reason they do what they do. In my opinion, this concept ought to extend beyond leadership to anything you and I do. So before we get into the nuts-and-bolts of crowfunding, I want to show you why crowdfunding matters – financially, creatively, and otherwise – so we can better understand the how later on. Crowdfunding isn’t simply a pre-order process – it’s an opportunity to get your biggest fans and supporters rallied around a singular goal. The power of crowdfunding is this: it gives creators a reason to ask for support, contributions, and sharing, because we’re not simply looking for sales (conventional presale), we’re asking for help to turn an idea into reality. For those who leverage crowdfunding the right way, it’s a meaningful experience that lets your audience, readers, and supporters be an integral part of your project. When AJ Leon turned down a traditional publisher for his first book, some people thought he was crazy. A traditional publisher is the holy grail for authors, right? Instead, AJ decided to activate his audience through a crowdfunding campaign and inspired them to be a part of the book he (and his happy readers) originally wanted to create. Within a few hours of the campaign going live, AJ fully funded his book. Within 3 days, AJ had tripled his minimum funding goal. Could AJ have been successful if he simply offered his book as a pre-order? No doubt. But by leveraging crowdfunding, AJ gave his loyal readers (me included) a great opportunity to share and spread the word. If AJ didn’t hit his minimum funding goal, the book wouldn’t exist. What an excellent opportunity to help a creator who chose himself (instead of waiting for a gatekeeper to choose him). 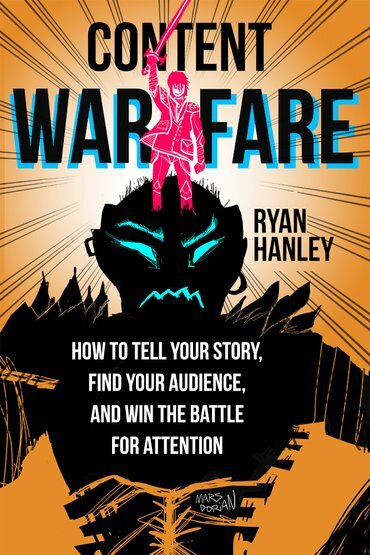 Ryan Hanley, the founder of ContentWarfare.com, has spent the last several years building an audience of people around the subject of spreading powerful, relevant messages that change lives.He’s done this by consistently producing and delivering actionable content on a weekly basis. And he’s done it absolutely for free for years. So when Ryan told me he was interested in writing a book, I directed him to Publishizer.com – a crowdfunding platform for authors. But he hadn’t written the book just yet. What if he spent years writing the book only to find out his audience wasn’t ready to pay? After all, when you deliver so much high value content for free, there’s a chance that people won’t pay for your work when you put a price on it (or so some marketers gurus would say). Long story short, Ryan launched the book on Publishizier and raised over $10,000 within 30 days. Now Ryan knows for sure his book is something his audience wants. Even better: he has the funds to create and ship it professionally (just check out his cover courtesy of Mars Dorian). Books take a long time to write. Good books even longer. Who wants to spend years writing a book that no one reads? When you crowdfund your book, you’ll know within 30 days whether your idea is something people care about it. Note: I’m not talking about hobby writing here. If you want to write a book just for the fun of it, you should, regardless if people read it. However, if you’re in the business of writing (being a paid author), you can’t ignore reach and sales. Leo Babuta is the founder of ZenHabits.net. For the past several years, he’s built an audience of hundreds of thousands of loyal readers who resonate with his message of simple, healthy, better living. 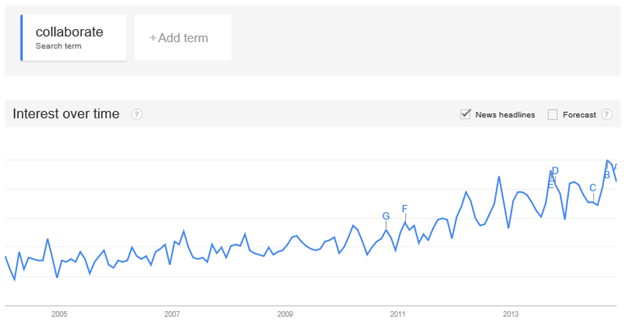 Because Leo has created so much consistently impactful content for his audience (notice a trend? ), many of them line up to buy anything he creates no matter what it is. If there’s one person who doesn’t need to crowdfund a book for financial reasons, it’s Leo. Yet Leo is leveraging the power of crowdfunding to launch his latest book. He’s already more than tripled his minimum funding goal, raising over $140,000 in a couple weeks. In the same way that crowdfunding allows us to turn our book into an event that activates and catalyzes our audience, it also creates hundreds (or in Leo’s case, thousands) of eager fans, waiting for your book. The cool part is, the person crowdfunding can include his supporters in the process of creating, printing, and fulfilling orders. Now instead of “Hey, here’s my book. Buy it.” you have an opportunity to share your story and journey, and to make your true fans a part of the process. Would it be nice to have dozens, hundreds, or even thousands of people eagerly awaiting your book before it ever hits the shelf? Let’s be honest: there is still a stigma to self-publishing. As a boutique publisher who has published multiple books, as well as someone who has self-published his own, I know firsthand this is an unfair response. The quality of self-published books are fast approaching the quality of traditionally published books. In most cases, there’s no noticeable difference (especially if the self-published author invests the time and money to hire the right people to make it great: editors, designers, etc.). 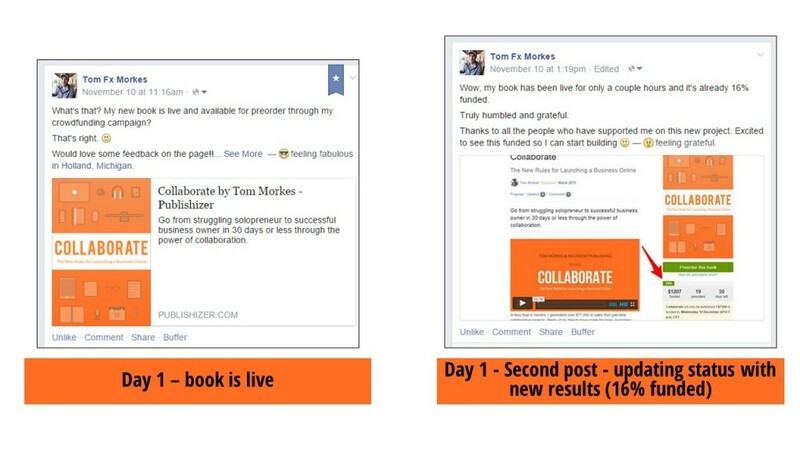 And this type of social proof can be leveraged in many ways to build your personal platform. 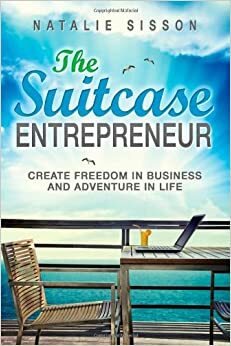 In 2013, Natalie Sisson, founder of thesuitcaseentrepreneur.com, successfully crowdfunded her new book (appropriately titled: The Suitcase Entrepreneur). Natalie already had an established platform with a devoted following, but crowdfunding her book gave her the opportunity to activate and catalyze this audience. Not only did she fully fund her book, but when it was officially released on Amazon, it became a best-seller almost overnight. She has since leveraged this success into appearances in major press like Yahoo Finance (among many others). Yes, anyone can self-publish, but how many can raise thousands from their supporters before the books been written? 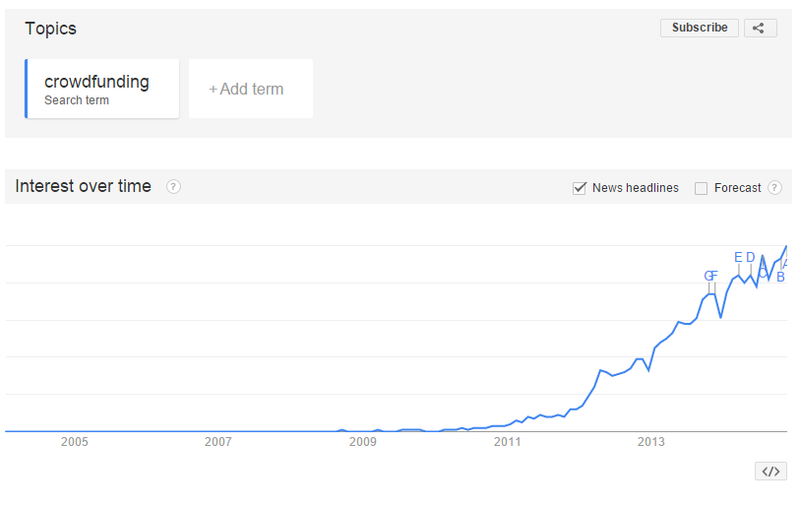 In the past few years, crowdfunding has blown up. The first crowdfunding platforms started in 2003 but really gained traction in 2008 and beyond. And the trend hasn’t stopped. There are even more crowdfunding platforms today. In fact, it feels like there’s a crowdfunding platform for every person, every niche, and every purpose on the planet. Just yesterday I found a crowdfunding platform for combat disabled veterans. It doesn’t get more niche than that. I’ll briefly cover each and the thought process behind why I chose the one I did (Publishizer). Kickstarter makes the list for several reasons, not least of which is the fact that South Park ripped on them earlier this season. In all seriousness, Kickstarter is one of the most popular crowdfunding sites on the internet. Like Google, Kickstarter is commonly used as a verb (“he kickstarted his latest book”), and has become synonymous with crowdfunding. Every day, hundreds of new projects are started on Kickstarter. Of those, about 45% will be successful. Trusted name brand. Kickstarter is known in the online community and is synonymous with crowdfunding. Trust is important when you’re asking people to pay for something that doesn’t exist yet. Lots of people and companies use Kickstarter to fund their projects, including many authors. The two books I’ve mentioned earlier – by AJ Leon and Seth Godin – both used the platform for their books. Leo Babuata is currently crushing his book’s funding goal right now on the platform. I’d just be a number. Kickstarter doesn’t care about me nor would I get any one-on-one attention. I’m not high maintenance, but when you’re launching a product or service using someone elses platform, I like knowing I’ll have support from a human being. I’d get lost in the crowd. Kickstarter’s size is a double-edge sword – great that lots of people visit the site but not so great because your project can easily get lost in the crowd. Strict Guidelines. 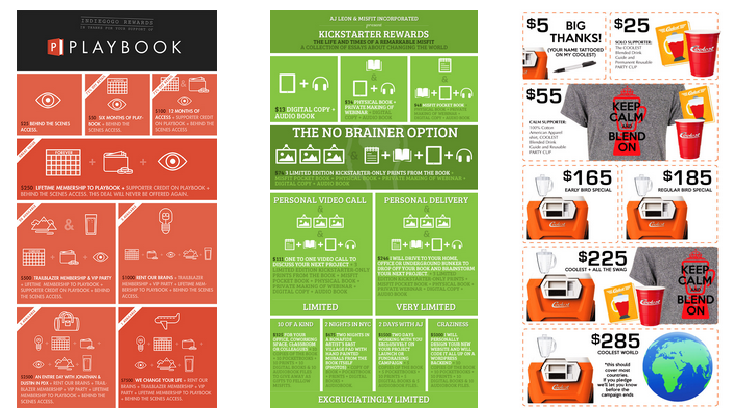 Kickstarter has the most rigid guidelines of the three crowdfunding platforms mentioned. Because of this, I’d be limited in exactly how I set up my crowdfunding campaign as well as what tiers and rewards I could offer. I wanted creative control over this process, so I chose not to go with Kickstarter. Indiegogo is a lot like Kickstarter – it’s a massive platform that allows people to crowdfund just about anything. However, while Kickstarter is fairly restrictive with what you can crowdfund and how you can do it, Indiegogo is much more flexible. For example, with Indiegogo, you can set “flexible” funding as an option. So if your goal is $10,000 but you only raise $3,000, you get to keep that $3,000 (minus 9%). Beyond the flexible funding options, Indiegogo is also known for being less restrictive when it comes to what you want to fund. Raising money for a charity? Indiegogo is fair game (Kickstarter would say no). While I view this as a positive, it may also contribute to the fact that Indiegogo has a much higher failure rate than Kickstarter. Only 1 in 10 Indiegogo campaigns get fully funded. Like Kickstarter, Indiegogo is a popular platform and actually receives more traffic outside of the United States. A big benefit to those of us with large audiences outside the United States. That said, for the same reasons I didn’t choose Kickstarter, I decided to skip Indiegogo. In addition, I didn’t need the flexible funding option (not my style) nor was I looking to make this a charitable fundraiser. Add to the fact that, statistically, much fewer crowdfunding campaigns succeed on Indiegogo than other crowdfunding platforms and I knew it wasn’t the platform for me. Fee: 4% + Amazon fee (3-5%) + wire fee ($25). For flex funding: 9%. Publishizer is my book crowdfunding platform of choice. The founder, Guy Vincent, is remarkably involved in every project. When I decided to launch my book through Publishizer, Guy helped me flesh out my crowdfunding campaign, making sure I didn’t miss anything along the way. While this might seem like a small detail to a “pro” (if there is such a thing in the book crowdfunding space), it was a big reason I was able to successfully fund my book in two weeks. Like Kickstarter, Publishizer doesn’t allow flexible funding (as of this writing). In other words: you either fund your project 100% or everybody’s money is returned. This was fine with me because I actually prefer this – the alternative makes it seem more about raising money than about having your audience play an integral part in the creation of a new project. Another positive: I had full control over how I priced my tiers and what I offered. And if you’ve checked out my book on Publishizer, you know I offer some pretty wild rewards. This was crucial for me as I wanted to do a hybrid launch (a book / infoproduct / consulting hybrid…more on this later). Publishizer is still relatively young in the crowdfunding space. That said, I asked the founder, Guy Vincent, to share some statistics for today’s blog post that haven’t been released publicly. Statistically speaking, I’m much more likely to fund my book on Publishizer than I am Indiegogo or Kickstarter. Further, on average, Publishizer campaigns raise more than Kickstarter or Indiegogo campaigns. A quick caveat to these assertions: I don’t have “book specific” stats for Indiegogo and Kickstarter, I simply extrapolated out from the collective data. Also, the platform is young, so these figures could very well change over time. That said, it was enough information for me to feel confident about crowdfunding on Publishizer.com. Note: if you find book specific stats for Indiegogo or Kickstarter (or other platforms), please send them my way so I can update this article. *Since the original publication of this blog post, Publishizer updated their offer and fee structure. They now help authors find publishers, and they have a new fee structure. This info is accurate as of January, 2018. Once you’ve decided on which platform you want to use to crowdfund your book, the next step is preparing for the crowdfunding launch. Quick note: everything I did for my crowdfunding campaign was based on backward-engineering successful campaigns, interviewing people who had successfully crowdfunded their books, and deep-diving into the statistics of what makes a campaign successful (as well as why campaigns fail). I do my best to link to the source material so you can go deeper if you’re interested. If you don’t take your campaign seriously, neither will your supporters. All successful campaigns have one thing in common: they’re planned and organized. There’s no such thing as a successful but sloppy crowdfunding campaign (that I’ve seen or read about in my research – please share if you find one). There are simply too many things that need to be done right, with the right execution and timing for someone to wing a crowdfunding campaign successfully (I’m sure outliers exist, but unless you’re an outlier, the better idea is to plan). I went into this launch like I was planning Operation Overlord. That’s not to say everything was executed perfectly, but I did know all the variables and had a handle on what I should expect walking into the launch. Like with all my projects, I started with a 1 page business model. 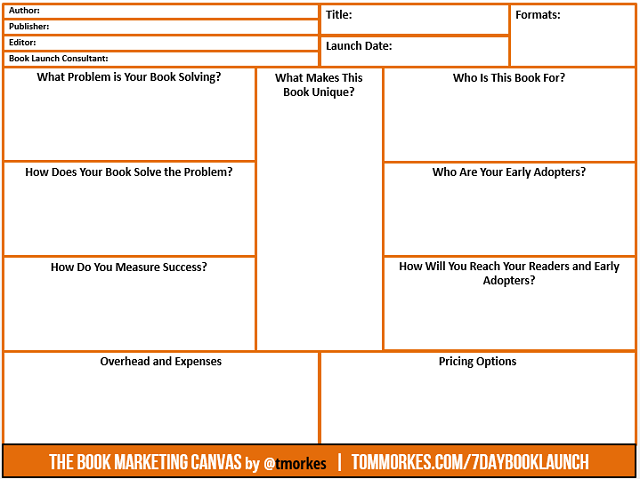 For books, I’ve developed my own one-page book marketing canvas, which was inspired by Ash Maurya’s Lean Canvas, but adapted for book marketing campaigns. The Book Marketing Canvas helps me identify all the essential elements of launching a book from scratch. It starts with key administrative information. Beyond the basic administrative information listed above, The Book Marketing Canvas clarifies exactly what our book is about (and why it matters), who it’s for (and how to reach them), and gives us a general idea of how we’ll sell the book (pricing options) and estimated overhead and expenses. Who are you trying to reach with your book? Who needs to read it? These are the readers who will show up first to support whatever you create. If you don’t have an audience yet, this is more difficult to define (also why I recommend building an audience before crowdfunding a book). 1. Early Notification List. This is a list I created through my blog. Here’s the landing page I created to build this list. How will you reach your readers? Crowdfunding campaigns are only as valuable as the readers you can reach. If you don’t have a clear idea of exactly how you’ll reach readers (words like “luck” and “hope” don’t count here), go back to the drawing board. 3. Consistent social media presence with almost daily updates on progress and milestones. Leverage Facebook and Twitter primarily (the social media platforms I’m most active in). What problem is your book solving? There’s no reason to write a book unless it’s solving a problem. For business non-fiction, this problem needs to be something clearly defined (with fiction there’s more leeway as fiction solves the problem of boredom). Solopreneurs, artists, and writers struggle with traction and turning their ideas into sustainable businesses. How does your book solve the problem? Every business book solves a problem – what does your book solve? A step by step guide to collaborative product development. Collaborate shows solopreneurs, writers, artists, designers, and creators of all types how to rapidly build and launch a cashflowing business in 30 days through the power of collaboration. Too many people run into new projects with no way to measure success or failure. Luckily, for a crowfunding campaign, success and failure is pretty clear: do you hit your funding goal or don’t you? Consider this the “UVP” (unique value proposition) of your book. Much like a startup, every book (especially nonfiction) needs a good reason for existing. This good reason should be captivating, original, and warrant peoples attention. There are dozens of books and hundreds of articles on the topic of collaboration from a theory level, but no other book has tackled collaboration from a practical, tangible level. Collaborate is the premiere guide for those looking to start a business online rapidly online through the power of collaboration, or those who simply want to learn how to work with and lead others in a collaborative setting. Here you want to itemize as accurately as possible the projected overhead and expenses from creating, printing, and shipping your book. Once we have The Book Marketing Canvas developed, we can extrapolate this into an outline and wireframe. At this point, you don’t have to be 100% sure of everything. This is an exercise in thrashing and chunking (removing waste + identifying key tasks and timeline), and will help you discover what you need to do at a minimum to fund your book. 1. Outline the chapters and key topics of your book. For this, I simply used Evernote to collect my thoughts, although I’ve had no problems using tools like Google Docs, Word, or Scrivener to do the same. 2. Create a working book cover design you can use for your crowdfunding campaign. Unfortunately, a book is judged by its cover. When it comes to crowdfunding a book, a cover is one of the most important element of the crowdfunding sales page. To successfully crowdfund your book, you’re going to need a finalized, or almost finalized, professional looking cover. Early book cover design for Collaborate (obviously, we changed the name). After a few more iterations, we ended up with the current cover – and even a name change. This is the cover I ended up going with and changed again before time of shipping the actual book, but it was enough to get my project up and running properly. My hope: that this line would be interesting enough for readers to keep them moving down the page. Next, you’ll need to explain what the book is about. In reality, this part is more about the reader than the book. This is the part where you let the reader know he / she is in the right spot. At this point, it’s helpful to have a graphic or something to help define your exact reward tiers. This is where you give a brief bio about yourself…like the “about the book” section, this part is about the reader, not you. You don’t need a finalized table of contents, but even an outline helps people get a grasp of what you’re building. People like to see where the money is going for projects like this, so be transparent! When will the books and rewards be delivered? The more specific the better. Always leave room for error (generally about 3x the time you expect it to take just to be safe). At the end of your crowdfunding campaign – much like any sales page – you want to end on a powerful call to action. I set the goal for my book at $7,500. First and foremost: it was the minimum I needed to create this book the right way (designer, editor, high-quality printing service, and based on a minimum order of 100 books). Crowdfunding campaigns with a $10,000 funding goal have a 38% chance of successfully funding. As you increase the price, your chances of success drop (at the $50k mark, your chances of success drop to 18%; at the $100k mark, it drops further to a 7% success rate). Just as importantly, the average successfully funded project receives about $7,800. While goals that are less than $10k have a greater chance of fully funding, there’s also diminishing returns when it comes to lowering the minimum funding goal. After all, what’s the point of starting a $1,000 crowdfunding campaign? Certainly you could reach your goal, but there’s no excitement from the point of view of the potential crowdfunding supporter. I wanted to aim for a goal that wasn’t easy, but also didn’t set me up for failure. And unlike Seth Godin and Leo Babauta who have hundreds of thousands of readers, my main list size is only about 1,500. It doesn’t matter if you have the best idea in the world: when you’re crowdfunding, reach is all that matters. Based on my list size and the probability of success for crowdfunding campaigns less than $10,000, I felt comfortable I could raise $7,500 (with enough hustle). In this excellent interview, AJ explains how Clay Hebert helped him design his massively successful book crowdfunding campaign. What Clay suggested was this: Your reward tiers need to be a “slippery funnel” where each incremental increase in price corresponds to a drastic increase in value. In other words, every reward should pack about 10x the value of the price you set. I took this advice to heart. I made sure that not only would contributors get the products and services I provided at a reduced price to what I would eventually sell them for, but in many cases I offered services that I have never offered nor will again (like the opportunity to work with me on a collaborative project). While the products and services I’ll be delivering on are a bit overwhelming for me, I can confidently say each level is 10x the value of what people are paying for (which makes the crowdfunding promotion process a lot easier). Before I decided on my project tiers, I wanted to see what was working for other artists and authors I admired. This is a breakdown of AJ Leon’s campaign. I bolded the three tiers that brought in the greatest amount of revenue to see what people were willing to pay for great rewards. Like AJ, Craig had a few tiers that accounted for about 80% of his revenue. From my own experiments in package / tiered pricing (both Pay What You Want and fixed), I’ve also found that while the majority of people may take the lowest priced option, the highest priced option almost invariably leads to the greatest percentage of revenue. While not a direct correlation, I also looked to general statistics on sales and upsells. 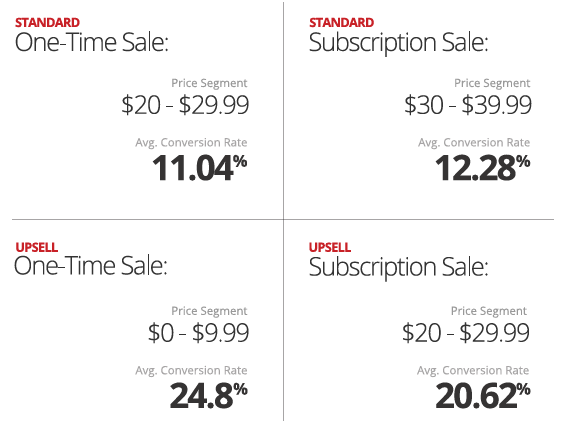 According to Clickbank, 24% of people buy an upsell after their original purchase. Using this data combined with past experience selling product with multiple price points, I knew that a percentage of my readers would be more likely to buy more than just the book if I had the right upgrade options available. To do this I had to make sure each tier was progressively better than the last and not too much more expensive from the current purchase price that no one would buy it. During my research, I noticed many book crowdfunding campaigns start at $1 or $5. Yet most of what I’ve learned in the past few years is that the hard sell isn’t the $5 or $10 option, it’s getting the person to decide to purchase in the first place. If that’s the case, why start low? I decided to make my book accessible yet heavily discounted off of the future price by offering it at $13 on pre-order (I plan to sell this book for about $29 – $49 when it officially launches). $13 is a price that anyone who is checking out my crowdfunding campaign can afford, so I figured it’s a good place to start. Another thing I noticed in many crowdfunding campaigns (those that fail and those that succeed) are big gaps between rewards. For example, many book crowdfunding campaigns I looked at made the jump from $5 to $25. This is a 5x multiple, which is a significant jump in what you’re asking people to commit to. I generally don’t like to make jumps greater than 3x the previous price point, which is why I made my second tier $34 (which is only 2.6x multiple). As you look at my reward intervals, you’ll notice I basically stuck to about a 2x multiplier for every new reward. The problem set I was working with was this: if people will invest in X, how do I get them to upgrade to Y? So if someone will purchase the “3 part live, online training workshop” option, what would I need to offer them to upgrade to another perk ? There have been numerous crowdfunding campaigns that buckled under the weight of their own offer. This guy went over the deep end when he realized he couldn’t afford to ship all his books to his supporters so he burned all the books he created (don’t worry, that won’t happen with me – I have self-respect). For Collaborate, I knew the only way I could afford to print and ship hardcover books in small quantities (on average, every hardcover costs about $42, not including shipping) would be to supplement the book costs with low marginal cost offerings, like the live webinar, the ecourse (The “No Brainer” option), etc. For those products and services, all the time, money and effort is up front, but costs close to zero for each additional unit produced. Because of this, my average contribution level is over $80, which gives me breathing room when it comes to printing and shipping (excluding the sunk costs of design, editing, etc.). I also organized my campaign in such a way that I could do everything remotely (save for the 2 day in-person training, which I made sure I’d be able to swing in the next 12 months). I knew the hardest thing for me would be anything that would require me to be somewhere in person (as I am on the road vagabonding a lot). There’s a good chance I’m going into the red for this launch. The cost to print just one hardcover book is $40+ which doesn’t include shipping. Add to that the professional design and editing and I’ll probably go into debt with this project. But this crowdfunding campaign isn’t the end in and of itself. A lot of people use crowdfunding as a one-off launch opportunity; they want to fund a project and that’s it. For me, I wanted to launch products and services that I could then scale after I built them. Case in point: I’m developing the Collaborate eCourse at the same time I’m writing the book. This eCourse will retail at $197+ (probably more) when I launch in early 2015 (although you can get it for $72 when you pre-order The “No Brainer” Package). This is one of the reasons I can go into the red for this launch but not worry about it – the products and services I’m delivering on are assets for my digital publishing business. Don’t overcommit yourself with crazy stretch goals. A stretch goal is what you offer crowdfunding supporters once you reach certain milestones in your funding. When I first started thrashing the rewards for Collaborate, I immediately thought of all the cool stretch goals I could incorporate for early adopters. 1. Most people don’t care about stretch goals. Most people want your main offer plus some awesome rewards or bonuses. Nobody buys into a crowdfunding campaign for a stretch goal. 2. Many crowdfunding campaigns have been dismantled by lofty stretch goals. Instead of trying to reach a threshold above my minimum funding goal, I wanted to focus on the minimum I needed to make this a reality. This meant ignoring stretch goals, at least until I funded my project. If you want to know why you should include images / infographics in every sales page, read this hubspot article. Bottom line: images / graphics are easier to understand and process and therefore = more supporters = more pre-orders. Essentially every successfully funded crowdfunding campaign I studied used an image for their rewards and tiers. There’s no reason to change things up if they seem to be working, so I decided to create an image too. I use the same icons that are present on my cover + the same font (for the headlines) + the same colors. This is consistent with the overall style of my book 2. Overwhelming is okay (if it keeps peoples attention). A crowdfunding campaign is not the time or place to create Apple-esque style, minimalist ads. I have a few minutes (if I’m lucky) to educate people on the topic and inspire them to support my campaign. With the image, I want to give as much pertinent information as possible so people could literally back the book immediately after viewing the packages. I also wanted to keep it all generally close together so that the reader is automatically drawn to the higher priced item. To create my graphic, I found inspiration from multiple sources and campaigns: From left to right: Playbook by Jonathan Mead, “The Life and Times of a Remarkable Misfit” by AJ Leon, and some kind of random cooler contraption by Ryan Grepper. These are just three of many that I studied and used as inspiration for my own graphic. Resistance Pro Tip: Before you start your campaign, study LOTS of other successful campaigns (specifically – book campaigns). You’ll notice trends that are otherwise inconspicuous, but could make a big difference in your campaign. As you can tell, there is a fairly consistent style of crowdfunding graphic that is used, which is why I designed the graphic the way I did. the more expensive your product or service, the longer your sales page should be I knew I was going to be selling some expensive products and services through the various reward tiers I was concocting. Now while most people order the digital book for $13, there are a few people out there willing to spend $1,000 – $3,000 for a product or service. 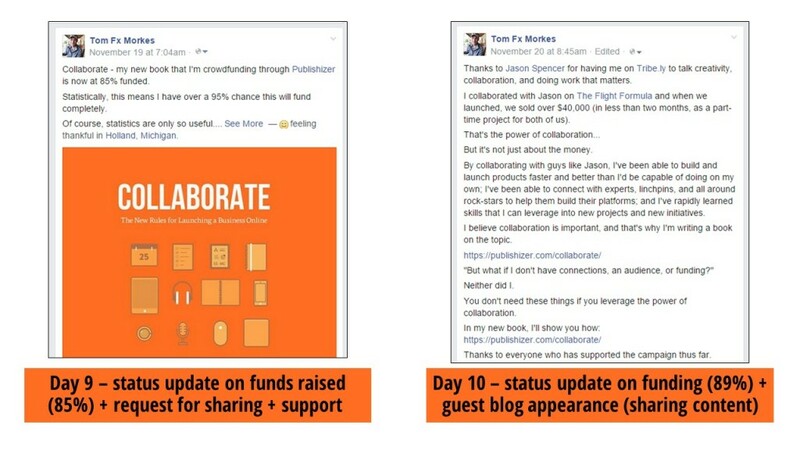 I didn’t write my sales page for the $13 supporters – I wrote it for the $3,000 supporters. 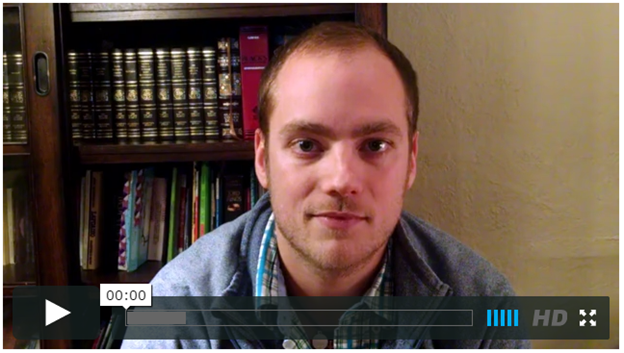 A short and sweet sales video is an important piece of the crowdfunding puzzle. 2. Because successfully funded book campaigns do it. And if people who are succeeding at crowdfunding are creating sales videos, I should too. I don’t have enough information to determine if it’s causation or correlation, so why mess with something that’s working? I decided to not put too much time, energy, or money into my video (instead, focusing that effort on the rest of my marketing and promotion…more on this later in the article). A lot of crowdfunding campaigns are upping the product value on their sales videos, but after watching Seth Godin’s video, I decided to keep it simple (3 points in under 3 minutes). I set up my camera, hooked up my microphone, hit record, did a few iterations (full run throughs, only restarting when I stuttered a little too much), pieced the video and audio together, and called it a success. This is just a quick 10 second intro to you, the author, so viewers get a sense of who you are. 2. What’s your book about and why does it matter? Why should I care about what you’re doing? 3. Why use the crowdfunding platform you’re using? Assume most people don’t know what a crowdfunding camapaign is and go from there. Because people who are listening to you deserve to be thanked. Always end with a call to action (buy my book!) Overall, it’s nothing mind blowing (except for my eyes, which you can get lost in for days), but my hope is that it gave people enough of an idea of who I am and why I believe in this project to inspire them to contribute. For my launch, I followed the same framework I use for every launch. In the following sections, I’m going to walk you through ways to effectively promote you book crowdfunding campaign. Many of these techniques I’ve either done myself (and will share my examples), or have seen other people use successfully. Let me know in the comments at the bottom of this article if you have any questions about these techniques and strategies. Content marketing is just another way of saying promoting a product or service through blog posts (or other types of content). Most people automatically ignore blatant advertisements, but when the marketing / advertising is within educational or value-add content, many more people will be interested in what you’re offering. In my opinion, content marketing is one of the best ways to market your book (I’ll show you my results in the next section). Guest blogging is generally effective way of building an audience rapidly. In the context of crowdfunding, many people use guest posting to promote their crowdfunding campaigns. Here’s an example of Maneesh Sethi guest posting on the Art of Manliness to promote his new bad-habit breaking device. The benefit to doing this is clear – if you choose the right blog, you can get your idea in front of a lot of new people who will be receptive to what you’re trying to fund. For Collaborate, I purposely didn’t engage in much guest blogging. I wanted to focus my attention on my own audience. Because of that, the only guest blog (equivalent) that went live was a short video with my friend and contributor to Collaborate, Jason Spencer of Tribe.ly. Why not a bigger push? Everything is a time / energy trade-off. Based on several launches I’ve done previously, I’ve founded the greatest return on my investment is from the audience I’ve already built. So If I’m going to guest post, it won’t be for a product launch, but to build my list (which means: saving the guest posting for another time). That said – guest posting is still incredibly powerful, so if you have the bandwidth – do it! If you’re crowdfunding a new book, your blog will be the best place to get your initial backers, as well as the best place to promote your new book. If you don’t have a blog, it doesn’t mean you can’t crowdfund your book (keep reading for alternative marketing channels you can use in lieu of a blog)…but really: you should start a blog. First, because your readers want to hear from you. Second, it means you have a base to launch anything you want. This is insanely useful if you want to be a full-time author. I’ll get off my high-horse now, but if you’re interested in why you should start a blog or how an author should start his or her blog, leave a comment below and I’ll get back to you with more details. Since I already have a subscriber list of about 2,000 (and about 3,000 – 5,000 visitors a month), I wanted to focus most of my efforts on the people who want to hear from me. For the launch, I created 3 key blog posts leading up to the launch + one major one after launch. The goals of the first 3 articles was to encourage people to sign up for the “early notification list” for my book. I ended up with about 130 early notification subscribers. Not great but not terrible. The goal with the follow up blog post was as a reminder that the book is live and being funded. On top of this, I also did newsletter-specific promotion + social media promotion for the book (more on this below). Medium is a free website that lets anyone write about anything. Because of that, there’s a lot of noise. But it also has the potential to be a quick and easy way to promote your crowdfunding campaign. I didn’t use Medium for this launch, but I did for my last book launch, The Complete Guide to Pay What You Want Pricing, an article ended up getting over 7,000 reads. Like Medium, LinkedIn publishing is another free and easy site to use to promote your ideas. It’s also great for business-specific books (not sure how great it would be for fiction). Here’s an example of a post I wrote for my own blog that I repurposed for LinkedIn. More new eyeballs means my ideas can spread farther (while still encouraging people to come back to my site and join The Resistance). I didn’t use the LinkedIn platform for my crowdfunding campaign, but would encourage other authors to consider it as it could be a powerful tool. Influencers are the people in your industry with audiences who will resonate with your book. Influencers are busy. Make sure you make sharing painlessly easy. Here’s an example of a page I set up to make sharing incredibly simple (for influencers and anyone else I could inspire to share). To get them to share, I sent them an email saying the book was live, thanked them for their involvement, and shared a click-to-tweet as well as a link to the crowdfunding page (and another link to the “support Collaborate” page). Resistance Pro Tip: to create a “click-to-tweet” go to bit.ly to create a shortlink from your crowdfunding sales page, then go to clicktotweet.com, add a short description and call to action for your book (less than 120 characters is good for sharing), create the link and share it. The majority of supporters used the click-to-tweets I shared, which helped get the word out on Twitter (although the verdict is still out on how helpful that actually is…no way to track for sure, but very few supporters for Collaborate came uniquely through Twitter). What industry-specific podcasts do you listen to? Are there any with audiences who would benefit from your book? These are the podcasts you want to connect with to see if you can share your book. It helps to give podcasts a month or two advance notice – like guest blogging, many are busy and backed up for months, so you need to get in early.  Like with guest blogging, I didn’t do a heavy push for podcasts – my focal point was my own audience. Luckily, a few went live at the same time my campaign was live, which helped fill out my social media campaign (gave me something else to share rather than the campaign itself). Besides emails to my subscribers, social media had the greatest impact on helping me hit my 100% funding goal for my book. 1. Focus on key social media platforms. Not all social media platforms are equal, but more importantly – choose the one you’re most comfortable on and have built the largest following on (in terms of engagement). I have way more followers on Twitter but I always receive the best feedback / conversation on Facebook. So Facebook is where I put my time and energy. 2. 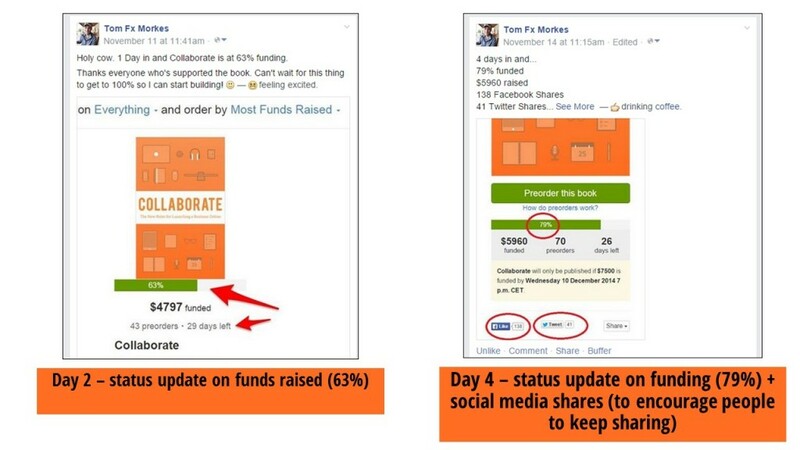 Use social media to give status updates of your funding. This is a generally non-offensive way of marketing your book. On more than one occasion, a Facebook friend told me he saw a post of mine and decided to support the book. Because I gave almost daily updates, I increased exposure to my crowdfunding campaign, which pushed me over my funding goal. I didn’t use paid advertising for my campaign, but I do know people who have used paid advertising effectively for other launches, and I’ve used paid advertising for a number of projects. If you’d like an example of how I use Facebook Ads to promote a launch, check out The Business Building Toolkit. Live events. This may be a little overkill for a book promotion, but worth considering if you have a local following. Niche-specific sales channels. For example: Writing a book on yoga? You could reach out to the owners of every yoga studio you’ve ever attended and ask them to share the campaign. This is just a random example, but the point is: there are a lot of direct and indirect sales and marketing channels for your book – you just have to think unconventionally. 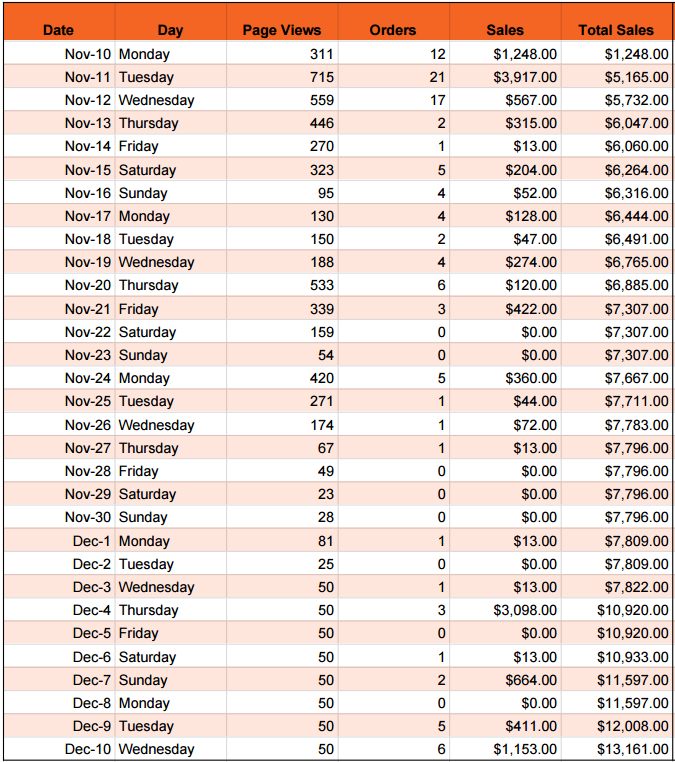 The following is an insider look at the numbers behind my crowdfunding campaign. My hope here is to make crowdfunding less esoteric / ambigous / overwhelming, and ultimately to inspire more people to try it out (with reasonable expectations). If this blog post can help even 10 more authors successfully launch their books using crowdfunding, that’s 10 more great pieces of art in the world that we need, and I’ll consider this a success. 1. Bookmark this page for your own book launch. Do this now so you don’t forget. This guide will hopefully always be around and I intend to expand on it with more data from my own launch as well as others as I collect more information. So bookmark the page so you don’t lose it! 2. Share it with someone you know. There is a social share option floating the the left of this article, as well as all the way at the bottom where the comments section is. If you’ve found this article beneficial at all, then please share it with an author you know. I promise you he or she will be happy you did. Predictably, the majority of my sales came within the first couple days of the book going live. Note: If there is a discrepancy in funds raised, it’s because some statistics are taken from the back-end of Publishizer, which includes shipping for international delivery. This only adds a couple hundred to total funds raised, which does not fully cover shipping but will offset it. 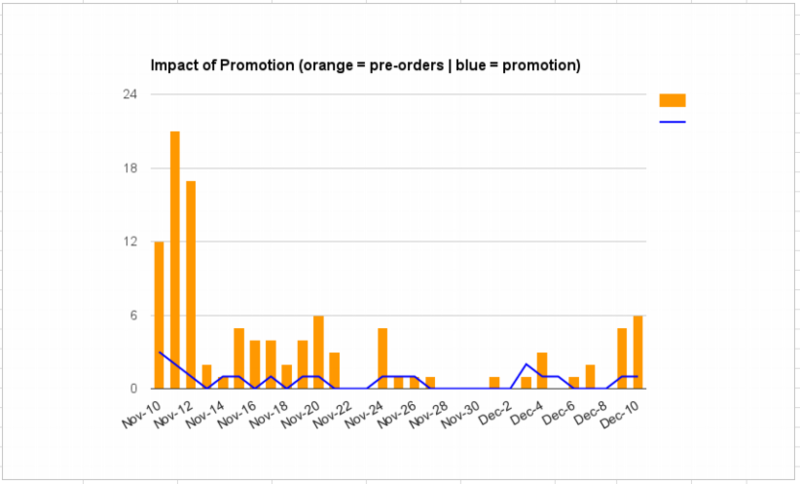 The daily pre-order totals isn’t very useful by itself, until you overlay it with my promotion schedule. 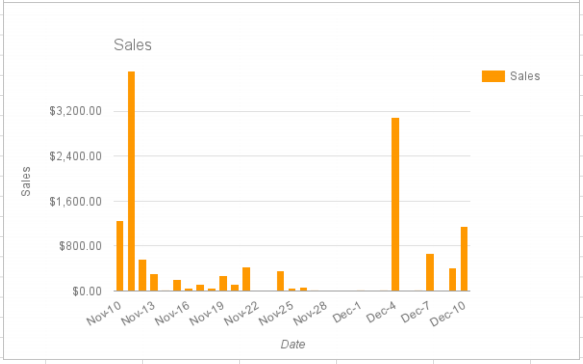 The following shows us daily pre-orders (in orange) overlayed with daily promotions (via newsletter and Facebook – my two primary drivers of sales). What you’ll notice is that there’s a direct correlation between promotion and sales. But what is surprising (at least for me) is how great the impact of promotion is in terms of revenue generated on a daily basis. This is statistically significant when we compare the average sales from newsletter promotion days to non-newsletter promotion days. If this isn’t enough incentive to make sure you are constantly promoting your book during your crowdfunding campaign, I don’t know what is. On average, promotion days resulted in 18 times more sales than non-promotion days. 1. Nothing moves unless you do. Since I raised 100% about a week ago, I stopped promoting this book. My goal was to get to 100% funded, which is where I’m at now. I also wanted to see if there would be any consistent momentum now that it’s hit its funding goal and so many sources have promoted the book. This is not the case. If I want a new surge in pre-orders, I’ll need to start promoting again. 2. An email list is a powerful thing. I put a lot of work into this campaign but I’ve seen other people put in double or triple the work and come out wanting. I don’t take this lightly. For me, it’s a reminder to continue building trust with my readers so that I continue to earn their attention. This is more valuable than all the paid advertising in the world. 3. No amount of influencers can make up for the tribe / gang / fan-base you’ve built. I think it’s important to get a list of “influencers” on board to support your big launches, but the reality is this creates statistically insignificant sales compared to sales I can generate through The Resistance or my other email lists. 4. Don’t discount social media. Without having a social media platform like Facebook, I don’t think I could have fully funded my project. 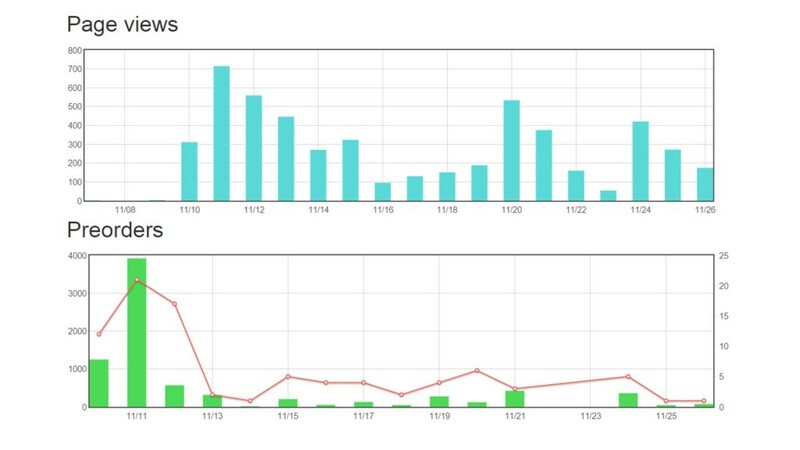 Second to my own email newsletters, Facebook drove the most traffic to my page. And based on the responses to many of my Facebook posts, sharing campaign status updates gave people the nudge they needed to go and support the book themselves. Quick note: I chose Facebook because that’s where I’m most active relative to other social platforms, but I’ve heard great things about Google+ and LinkedIn. The point isn’t which one to choose, but to commit to one so that you have real people communicating and interacting with you (and you’re not just spamming…which is sometimes how I feel about Twitter and other social networks). 5. Nothing beats a personal email (or call). I sent out about 50 personalized emails for this campaign asking key influencers, collaborators, and friends to share the book. What happened was not only did the majority of people happily share (thank you), but many contributed to the campaign themselves (double thank you). A lot of my advice hinges on the community (The Resistance!) I’ve built up over the past two years. That said, even if you don’t have a big email list, plenty of successful authors have leveraged other platforms to build interest and get their book funded. The important takeaway – even if you don’t have a list, you can still leverage social media and other platforms to spread the word. And more importantly than having an email list is focusing on the people who DO support and inspiring them to share and spread the word. There’s nothing more powerful than word of mouth when it comes to turning an idea into reality. A lot of people have asked me recently about crowdfunding their next book. I believe my (limited) success has inspired some people, which is great and makes me happy…and also nervous. Here’s the deal – just about no one out there will tell you to not reach for your dreams. It’s negative and it’s not the type of information that gets spread. There’s a whole area of psychology that explains why this is (survivor bias), but I won’t get into it here. But I will say I believe I’m doing people a disservice if they attempt something like this without knowing when it’s appropriate. Crowdfunding is powerful…but like the statistics shows: it MOSTLY fails. So maybe the best way to wrap up this blog post is to look at WHY crowdfunding fails and how you can avoid it. If there’s one person to listen to when it comes to crowdfunding (or marketing, or book publishing, or having a toy made of you), it’s Seth Godin. I mentioned it earlier, but Seth raised $287,342 (7 times his goal) for his book: The Icarus Deception. He was able to do this because he’s built up a tribe of million(s) over the past 20+ years. When he gets ready to release something, people line up. According to Seth, crowdfunding is the last step, not the first. Crowdfunding is a way to activate an audience and catalyze a movement – not a way to build one. There are exceptions and outliers to that rule, but if you can’t predictably engineer a result, why attempt it? There’s nothing worse than putting time and energy into something that is going to fail unless statistically improbable luck plays a factor. Much better to put the time in NOW to build a platform / tribe / gang / whatever that will support you when you are ready to rock and roll. While crowdfunding is a great validation of what you’re building…crowdfunding itself shouldn’t be used as the validation mechanism. Your idea ought to be validated before you attempt to crowdfund its production. If you’re just looking to raise money for a project, don’t use Publishizer, or Kickstarter, or Indiegogo – develop a business plan and pitch investors. Or better yet: bootstrap it yourself. Echoing the earlier lesson, crowdfunding is about activating your audience and inspiring a movement (even a small, $7,500 movement). In a lot of cases, crowdfunding doesn’t even lead to financial gain (I mentioned it earlier, but I’ll be lucky if I end up in the black with this book…ouch, right?). Calling all writers, authors, bloggers and anyone else interested in writing and publishing a book in 2015 – what would you want from a crowd-funding/preorders/crowd-publishing platform for your book? Share your thoughts / questions / ideas below so we can all learn. Hope you enjoyed this article. It’s over 10,000 words and took me over 10 hours to write. I’ll continue to update as my campaign comes to a close. And finally – if you found this valuable, please share! I”m a big fan of pre-selling in my business and I”ve been doing it for over 10 year with dozens of projects. It’s only been recently(the last 3 years) that I kicked into a higher gear by being more systematic, more customer-centric and more committed to delivering value in months that lead up to the shipping of the project. Tom has made an incredibly helpful framework here for product-creators, not just book authors, to follow here. Don’t forget: many of the people on your list are now conditioned to pre-pay and accept the pre-selling message with the success of Kickstarter and many other crowdfunding platforms. Properly framed and presented, customers understand the need to set up selling in this manner because our economy is such that, for entreprenuers i particular, there’s not a lot of wiggle room for mistakes with the creation of products. Certainly the physical realm is this way. Digitally, I would be curious, Tom what are some of the ‘arguments’ one could present to their audience inside a discussion of viability, availability and scarcity of a digital product? As to the arguments for the availability / scarcity of a digital product…if I’m understanding you correctly, the reality is that even digital products take time to make. And if there not evergreen (for example: current marketing trends, the latest tech, etc. ), the scarcity is present in that each new update requires time, energy, and money to create. And if you infuse something personal into your digital items (a one-on-one call, live training, a corresponding physical print, etc. ), I think scarcity / availability becomes a non-issue (in that – people recognize there is a trade off to create and deliver these things). Of course, that’s the challenge…to demonstrate value with a digital offering without resorting to false scarcity. The best way to avoid it – actually bake in limited availability to a product or service (in this case – for crowdfunding – the scarcity of time is baked into the crowdfunding itself). Let me know if that answers your question! What I’ve done in recent product launches to help frame scarcity better – that either are digital OR have a digital-alongside-physical component – is to simply just PULL the offering of the market. A lot of people(if not most) do not do this. State that the product will be off the market, unavailable for sale after a certain date – then do it. Pull it down. It gives you solid reason to communicate a key point to your list as you get to the end of the launch/promotion…and it works. Like most launches, the spikes are on the front end, a modest one in the middle, then jump again at the very end. Same applies with digital -but leverage scarcity better, just make it part of the product marketing that the offering goes off the market at certain date. Just don’t say it’s off the market ‘forever’. Because you can bring it back onto the market again in six, nine or 12 months – and make that an event to all the new people on your list – and revisit the offering for those who did not convert before. OH! an add-on to this. A bit of a reality check. Here’s the truth – at least in my 20+ years of online selling. After the promotion period is done, VERY, very few sales happen. At least, enough that they matter to the everyday bottom line. So why not accept that – and integrate that reality into your marketing and promotional launch design…..and pull some(or all) of your new products off the market when the promotional period is done. 1. give you a chance to create a ‘wait list’ for those interested who come across the offering – always nice to sub-segment your list. 2. when you re-launch down, the line, you have a list of ready buyers when you need a bit of a spike with sales when things are slow. Of course, there’s conversions issues. Just because someone is on a wait list is no guarantee they will buy – each list will have its own behaviors of conversion. In my case, it’s pretty high – usually 80+% of wait listers area ready to buy when notified. That said, give them a reason to buy now, if it all possible. Wow, I love this Bruce. Seriously good stuff. I’ve always been hesitant about removing my stuff in this kind of “launch-based” style…but it obviously works. I may do this when I release the “Collaborate” eCourse in early 2015. Not only to inspire people to join, but going every 3 months or so lets me focus on the launch then, more importantly, the people in the program, and leading them through the program from the beginning. Tom, I’ve been writing evergreen content for the past 7 years and publishing on my blogs and sites like hubpages.com where I am known as livewithrichard and Richard Bivins. I’ve also published a couple non-fiction ebooks on Kindle. My real joy comes from writing screenplays and fiction. I’m nearly complete with my first YA Urban Fantasy book which I hope to turn into a series. In your opinion, is croudfunding a viable outlet for writing fiction? I’ve only investigated Kickstarter and see many fiction projects but also see very few of those get funded. Anything is viable if you already have a tribe or audience who is personally interested in it to succeed. I know plenty of successful fiction crowdfunding campaigns, but they all had one thing in common: a core group of people to support from the start. Thank you for this very detailed and insightful post. I shared it with my creative friends. One of them wants to crowdfund her film project. Our group talked about how there are no books about how to crowdfundnso this amazing post came at the right time! Tom, this was an amazing post. I hadn’t even thought about crowd funding my book, but I was transfixed by your article. I learned so much. I was already familiar with Kickstarter; I’ve spent lots of time on that site supporting other artists — especially those without a platform because I’m a sucker for a good underdog story. But I had never heard of Publishizer. I need to check them out! But my favorite takeaway from this piece was your author canvas. I’m a fan of the lean start up model, and I’ve actually used the business model canvas before, but I hadn’t considered it in the context of my books. I’ve downloaded your samples and I’m going to sit down and really work through them. Thank you so much for this helpful post and materials. I look forward to purchasing your book. Fantastic Marjorie. Let me know if you have any questions about the Book Marketing Canvas! My logic goes like this if you use crowdfunding then you are making a donation or an investment rather than a sale. Tax is only charged on a sale so therefore by going the crowdfunding route it might be possible to circumnavigate the whole VAT mess. I am not sure if the taxman knows much about crowdfunding and how effective an evasion strategy it really is but any port in a storm. The alternative is selling stuff via marketplaces that I know already charge me VAT like ClickBank or Amazon. Places I have tried to avoid like the plague for years. The EU wanted to catch a few big fish and make them pay more tax instead they have discovered shoal after shoal of little fish that they did not know existed. Little fish who have been caught because the wrong net has been used to catch the big fish. Little fish who might stop trading rather than risk breaking the law while the big fish swim on regardless. Big fish who have teams of accountants to sort out their tax affairs while the little fish try to do as much as they can themselves so the added burden could be a death knell for them. See why crowdfunding looks attractive! It looks like you need to reach your goal on Publishizer or you don’t get the funds. The funds are from pre-sales, is this right? But you’re still responsible for fulfilling the sales? What am I missing? That’s correct. Like all crowdfunding platforms, it’s just a away to raise funds. You still do the fulfillment. Crowdfunding is a great option for self publishers and get them way more than just the money they need for their publishing efforts, as you really well pointed out in this article. Thanks for these great advices! Wow – such a long and detailed article. I sign-uped on Publishizer but I write fiction I did a quick research on fiction books and it seems most them get no crowd-funding (like only 4 copies being sold out of 500). I am curious if you have any more specific detailed information about crowd-funding fiction books. Crowdfunding may apply to many different projects. Many of these concepts in other products carry over to books. It can be a great concept if utilized properly. Not only for the funding aspect, but also creating awareness and building new customers (presales). I think you do need to have some experience of course and be known in some circles, but so much can be done in the early stages. In terms of creating an audience(awareness) and validating your book. Then finally proceeding with a campaign. The last part of this post was extremely powerful to me. I am starting to work on my crowdfunding campaign and I’ve been reading all I can find online and in books to make sure I am ready to launch my campaign. Everything I’ve been reading is mostly on the ‘hows’ to make your campaign successful, so I’ve been focusing more on the organizational aspect of a campaign, instead of the audience. And this made me realize that my main focus should be on building an audience I think would enjoy reading the book I am writing. 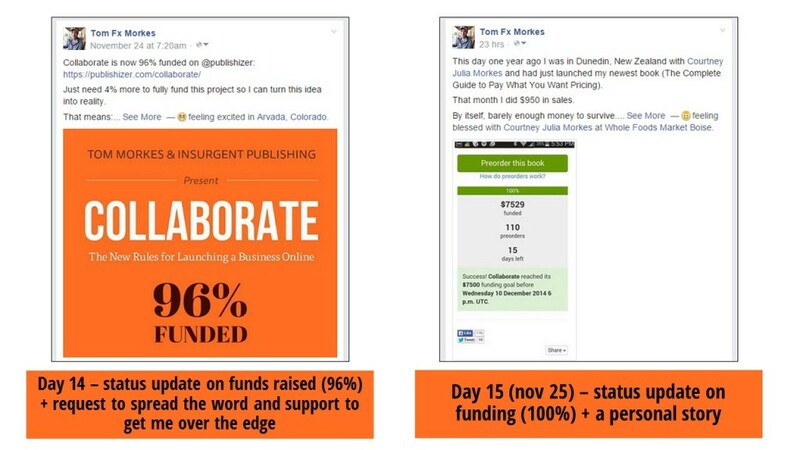 Engagement is most important part of a crowdfunding campaign really, the rest is just marketing organization. I am reorganizing my focus and will now focus on building my tribe! I am a content marketing professional, dealing with content and creating content every day. Usually, my searches for reading material leave me disappointed with the level of found content, full of cliches and non-helpful to say the least. This article is absolutely wonderful, and so very valuable and insightful! I accidently came across cloud funding. Here I am with you. Please look into my matter and see if you could work something for me. My website gives you an idea. This is an amazing article – soooo appreciated. We have a family movie out “How to Beat a Bully” – which is a “Home Alone” kind of comedy with an anti-bullying theme and we are now completing the novel, “How to Beat a Bully” which will be for middle school students and pre-teens and tweens. We want to crowdfund for the book. Are there some platforms that are better for this demographic? It would probably be the parents that would be helping us fund it even though it is for their kids. Some of our incentives would be pre-sale of the book, but also consultations on screenwriting, etc. Any advice would be great – since we know this book is in a specific niche. Thank you. Marilyn – I’d only pursue this if the audience you have is engaged and open to a crowdfunding campaign. Presumably you have an audience, so I would survey them for the feedback on the campaign, and ask in one of the questions if you offered X rewards, would they buy? If you get a sizeable, positive turn out, I’d leverage this group of people and responses into a street team to help you craft the rewards and be your early adopters when the launch starts. Wow, so happy I read this before getting too deep in the mire of my pre-launch. Hi, I’ve just launched my project with kickstarter. In reality my novel already exists…but is in Italian. I’m in effect an Italian journalist and writer and my novel “Reti di Smeraldo” has had a good success in Italy, and won prestigious awards. The point is that my novel takes place in Ireland and some frinds asked me. “Why don’t you write it in English”? Well with my publisher we decided to try a crowdfunding to translate the book in English, publish it and to promote it in Ireland, England and, hopefully, North America. What’s the most difficult part? That most of my friends and supporters are Italian and the can get the book. I’m trying to extend the project all over the world. Do you think it’s a good idea? And you have any suggestion how to do it? Thanks for taking the time to debrief your campaign !